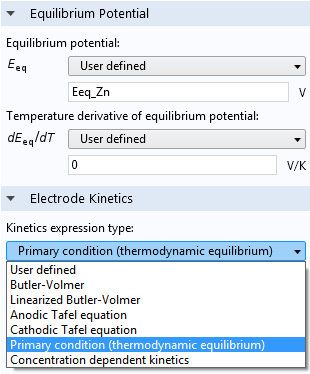 For users of the Electrochemistry Module, COMSOL Multiphysics® version 5.2a brings new interfaces, including a Nernst-Planck-Poisson Equations interface, which is useful for investigating charge and ion distributions within the electrochemical double layer where you cannot assume charge neutrality, and a new multiphysics node enables you to easily couple electrochemical heat sources to a heat transfer interface. Read about all of the Electrochemistry Module updates in further detail below. The new Nernst-Planck-Poisson Equations multiphysics interface can be used to investigate charge and ion distributions within an electrochemical double layer, where charge neutrality cannot be assumed. 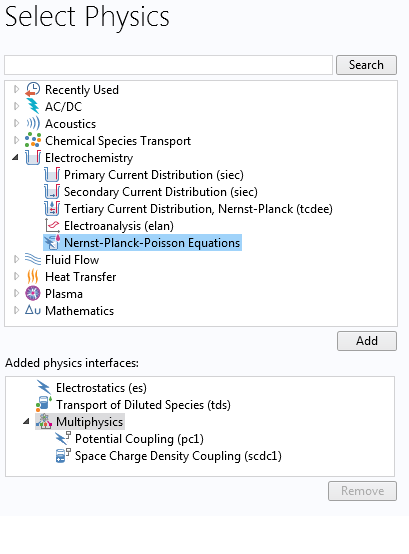 The Nernst-Planck-Poisson Equations interface adds the Electrostatics and Transport of Diluted Species interfaces to a model, together with predefined couplings for potential and space charge density. 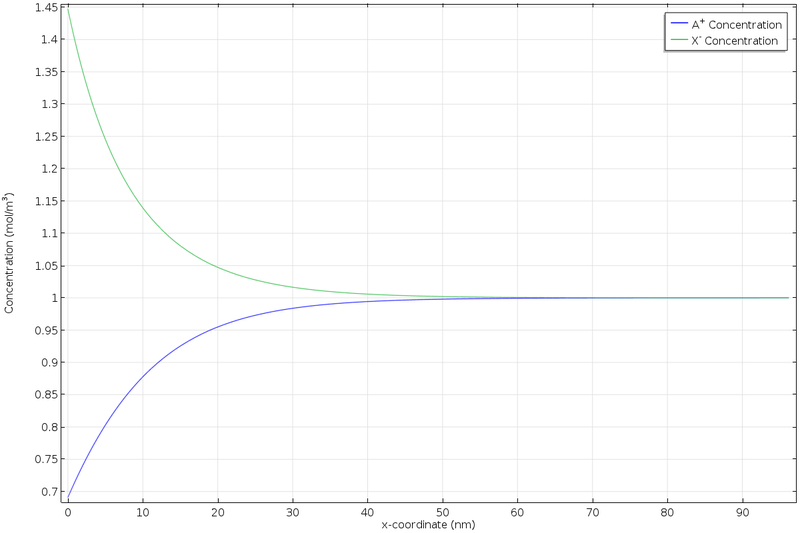 The concentration of a cation (blue) and an anion (green) close to the electrode surface at x = 0. The sum of charges deviates from 0 close to the surface, forming a diffuse-charged double layer. 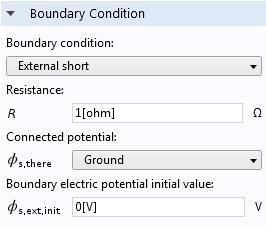 The new External Short boundary condition lets you short circuit Electrode Surfaces, Porous Electrodes, and Electrodes through an external lumped resistance. The new boundary condition is suitable for studying short circuiting in batteries, for instance, or for interconnecting large, electrochemically active objects in corrosion protection problems. The new Electrochemical Heat Source multiphysics interface offers an optional way to couple the electrochemical heat sources with a heat transfer interface. 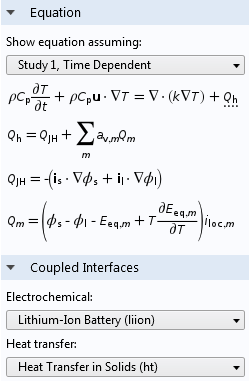 Electrode reactions now support a new Thermodynamic Equilibrium electrode kinetics type (known as Primary Condition in the Secondary Current Distribution interface), which assumes zero overpotential (negligible voltage losses).